Thousands of people have watched the first night of explosive action at the 10th annual British Fireworks Championships at the Plymouth Sound. Eight companies are vying to win the title during the competition in Devon on Tuesday and Wednesday. Organisers expect more than 100,000 spectators to attend the two-day event. People have been advised to leave their cars at home and use public transport. The city's three park-and-ride facilities are also being kept open. Many organisations, including charities, have organised special boat trips in the Sound. Daniel Millar from Plymouth described the display as "breathtaking". He had driven to the car park at Jennycliffe more than five hours before the competition was due to begin, to ensure a prime vantage spot. "It's been worth the wait - absolutely beautiful and spectacular", he said. "Even the weather behaved, with some earlier rain and mist clearing up just before it started." The Plymouth Chamber of Commerce said the event was expected to bring hundreds of thousands of pounds into the city's economy at hotels, pubs, restaurants and shops. The displays start at 2130 BST on both evenings. An estimated 10 tonnes of explosives will be detonated and competitors have just 10 minutes each to put on their display and wow the judges and the crowds. On Wednesday, there will also be a world record attempt to fire 55,000 rockets at once as University of Plymouth lecturer Roy Lowry attempts to blast the most rockets ever fired simultaneously. He will use 15 specially constructed frames laced with pyrotechnic fuse which will be ignited electrically. He hopes to beat the current tally of 39,210 rockets, which was set by Terry McDonald in the Channel Island of Jersey at the Battle of Flowers' Moonlight Parade in 1997. "Simultaneously" is defined as within a five-second period starting from the first rocket to take off. 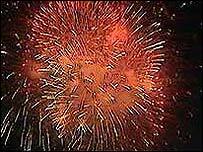 The city is to continue to host the annual British Fireworks Championships for the next five years. Peter Smith of the city council said: "Plymouth's waterfront is the perfect venue for the fireworks championships, which are attracting more and more people every year."